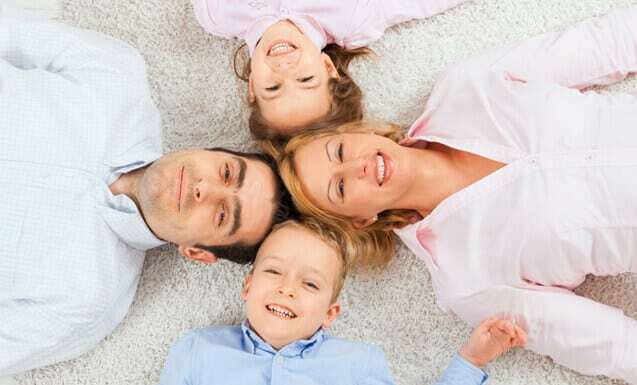 Simpo recommends weekly vacuuming and professional carpet steam cleaning at least twice a year to keep your carpets in good condition but there are going to be accidents and it’s important to act fast when this happens to prevent the stain from soaking into the fibers. Fill a plastic bag with a few cubes of ice and rub it over the patch of gum for as long as you can or until the gum has frozen hard enough to be scraped away carefully with a dull-edged knife or spoon. Repeat the process until every bit of gum is out. Get rid of the gum immediately before it softens and sticks to the carpet again. Alternatively, use a hair dryer to heat and soften the gum. Once softened, use your fingers to pull it out gently. To remove gum residue, apply a little peanut butter to loosen the residue. Finally, use warm water, soap and a gentle cloth to clean up the spot. When dealing with feces and vomit, the first step starts with scarping it all up with a dust pan and a small broom – make sure you wear a pair of disposable gloves. For urine use an old towel to dry up the wet spot first. Next, use warm water, dish soap, and a sponge or piece of fabric to get rid of the stain. Once the stain is gone, use a towel, a piece of highly-absorbent cloth or some paper towels to dry the spot. To get rid of smell, sprinkle some baking soda over the spot, rub it in with a soft-bristled brush and vacuum away after 30 minutes or so. Using paper towels or an old towel, blot up as much wine or coffee as you can. Next, mix one tablespoon of white vinegar and one tablespoon of liquid dish soap in two cups of warm water and using a clean cloth, mop the stain gently. Apply your mixture bit by bit while blotting gently with a dry cloth. Once the stain disappears, vacuum the spot dry or use a clean towel or cloth to dab the spot dry. Vacuum away or remove as much dirt or mud as you can with a broom and dust pan. Next, mix a teaspoon of dishwashing soap or detergent to a cup of lukewarm water and use the solution to scour the stain off using a soft cloth. Use a fresh solution as needed (and a fresh cloth too) until the stain is gone. Use an old towel to pat the area dry or vacuum it dry instead. Pour a generous amount of oil-free hair spray onto a small towel or white cloth and dab the permanent marker ink stain firmly. Repeat the process with a fresh towel or cloth until the stain is no longer there. In conclusion, if a stain looks too heavy or too big for you to handle yourself, call a carpet cleaning service in order to prevent further damage.